If you love to hear a good band, this year during football season, three Scioto County school bands must have been playing some very good music because during the State OMEA Competition, one school received the top honors and the other two, were right behind them. 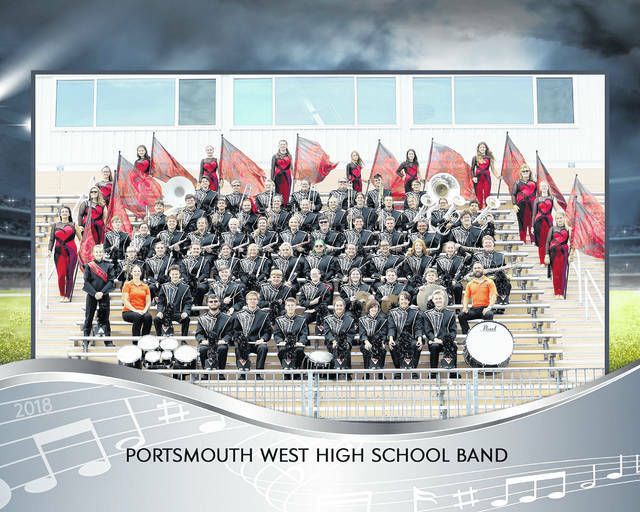 West High School Marching Band received top honors and both Northwest and Minford received the second best honors. Band people do not always receive the recognition they deserve, considering they practice as much as or more than the football teams do. Imagine going to an Ohio State football game, without the band playing. Speaking with all three of these band directors, they gave all the credit to the students who put in the work to make the band what it is and how well they performed at the competition. West Marching Band Director, Ryan Ervin has been the band director at West for four years. This is the third time in West history that the band has received a superior rating, the highest score a band can receive. Two out of the three times receiving the superior rating has been under the direction of Ervin. He said he believed the band received superior in 2014, then 2016, and then this year. Ervin has an assistant, Sonja Jarrells, who is the middle school choir director. She assists him during marching season with color guard instructor, Becky Lovins and Percussion Instructor, Noah Foster. Addison Guilliams, is the drum major for the band. Ervin said for three weeks in the summer, before the Scioto County fair, they practice (band camp) from 8am to 4 pm everyday. He says the students put in a lot of work, but once they go to the competitions they are excited, especially when they see the results. “This was a good season for the students, we had a small senior class, we had six seniors and a total of 76 members in the band. With so little seniors, we should see some growth next year,” Ervin stated. The band’s theme for their show this year was, ‘Law of Attraction.’ This included music by Tchaikovsky, Overture to Romeo and Juliet and that was part one that they called, ‘Ask.’ Part two of the show, was called, ‘Believe,’ and that was a song called ‘Believe,’ by the band, Mumford and Sons, and part three of the show was called, ‘Receive’ which was taken from a song called ‘Joy’ by Joeseph Curiale. Ervin said he has a good group of students that he felt enjoyed marching band, if they didn’t enjoy it, it would be really hard for them to do what they do. He says he has students that do multiple things and they try to split their times with things like Soccer, Volleyball, Cheerleaders and other things. 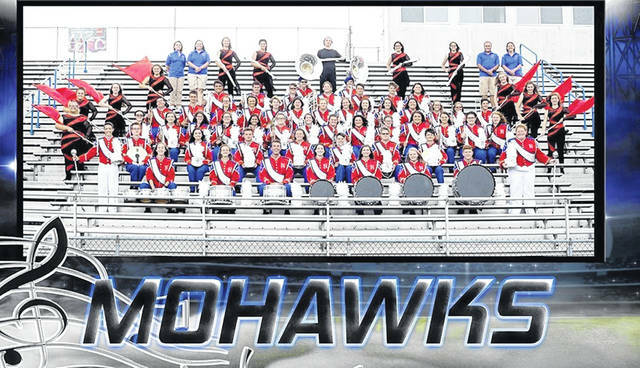 The Northwest Marching Band has been able to go to the state competition for 23 years, since they first competed in OMEA (Ohio Music Education Association), according to Christy Stephan, the band director at Northwest. This year the band received an excellent rating, and she said that that is right under the superior that West scored. Stephan said they have 65 members in their band which includes everyone who competes. Stephan says that Callie Barnhouse is the band co-director. She also said the flag director is MaryAnn Litreal and the percussion instructor is Dakota Holsinger. The Field Commanders of the Northwest band this year, are Emma Carter and Jacob Lynn, who are both juniors. Just like most marching bands, they start practice in the middle of July. That, she says, doesn’t just include marching band, as there is parade preparation, fair performance, and football games, it’s not just competition. Stephan says that the students put a lot of work in the band and they enjoy performing in front of the crowds. This year they received the excellent, just like Northwest. 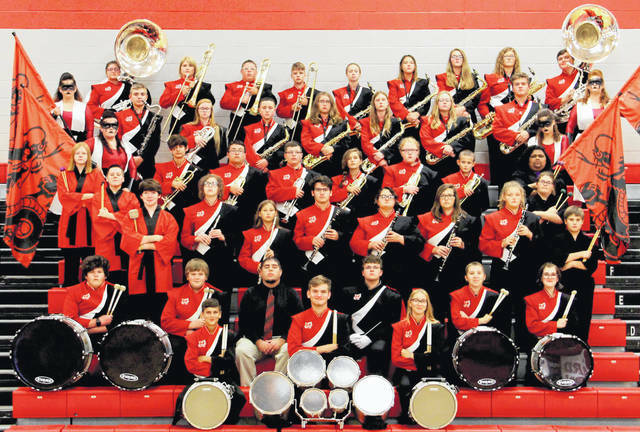 Their Show Title was, ‘The Heart of the Warrior.’ The Minford Marching Band has 48 members. The band’s staff, includes: Zachary Holbrook- Percussion Instructor, Victoria Hicks- Color Guard Instructor, Mike Pierce – Visual and Brass Instructor. This year’s band Drum Major, was senior, Mason Yeagle.